Apple holds almost 60% of the tablet market with the iPad, while most of its rivals have struggled to make a dent in the market. NEW YORK (CNNMoney) -- Apple unleashed the original iPad two years ago, selling millions and silencing tablet-market naysayers. As Apple prepares to unveil the third version of its tablet on Wednesday, its rivals are still stuck at the starting line. Competitors initially scoffed at the idea of a tablet -- Google's Eric Schmidt said in 2010 that there was no "difference between a large phone and a tablet." 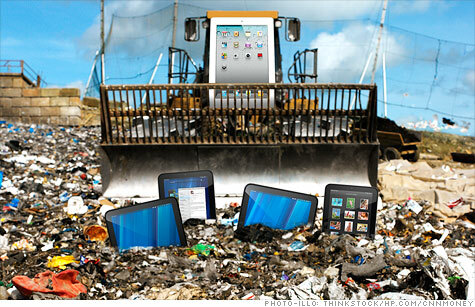 They were left scrambling after Apple sold almost 3.3 million iPads in its first quarter on the market. One year after the iPad's debut, more than 100 non-iPad tablets were on sale or in the works. But by then, Apple was already onto the iPad 2 -- and most of the would-be contenders never even made it to market. Those that did were almost all dead on arrival. As a Samsung executive put it bluntly last month: "Honestly, we're not doing very well in the tablet market." Apple (AAPL, Fortune 500) sold a record 15.4 million iPads in its latest quarter and now holds a 59% share of the tablet market worldwide, according to estimates from a February report by DisplaySearch, a research arm of NPD Group. Amazon came in a distant second, at almost 17% of market share, followed by Samsung with nearly 7%; Asus at 4.6%; and Barnes & Noble with 3.5%. Two of those non-Apple contenders, Amazon and Barnes & Noble, went with tablet-lites: stripped-down devices that undercut the iPad on price. Amazon (AMZN, Fortune 500) began selling its $199 Kindle Fire tablet in November, hawking it as a media device. Barnes & Noble (BKS, Fortune 500) followed up with a similar Nook Tablet. Amazon's 17% market share is impressive for a device with just one quarter on the market. The company won't make much money pricing the tablet at just $199, but its goal is to sell content like e-books, apps, videos and digital music. Pure hardware players don't have that option -- and for them, the market is looking grim. When consumers face a choice between an iPad for $499 or another tablet for roughly the same price, they're overwhelmingly choosing the iPad. The tablet graveyard: Two especially ill-fated tablets, the Hewlett-Packard (HPQ, Fortune 500) TouchPad and Research in Motion's (RIMM) BlackBerry PlayBook, launched at the same price as the iPad. HP turned out to be a cautionary tale. It killed off the TouchPad tablet in August, after just 49 days on the market. RIM's PlayBook is still alive, but it's gasping for breath. The tablet went on sale in April 2011 and immediately drew criticism for its unfinished feel. It lacked built-in apps for key functions, including email, calendar, address book and BlackBerry Messenger. Tablet users had to connect to a BlackBerry smartphone for those functions for nearly a year, until RIM released the 2.0 version of the PlayBook's operating system last month. RIM revealed in December that it shipped only 150,000 PlayBook tablets in the third quarter. That was a drop from the already paltry 200,000 PlayBooks shipped in the second quarter, and the 500,000 shipped in the first. Samsung's try-it-all approach: Two Android-based tablets -- Samsung's Galaxy Tab and Motorola's (MMI) Xoom -- entered the market with an even higher price tag than the iPad, at $599 and $799 respectively. The Xoom generally impressed reviewers, but its sales disappointed from the start. Motorola was forced to cut the price of its Wi-Fi-only tablet to $499, the same as the iPad, just a few months later. Meanwhile, Samsung is throwing just about every size tablet out there to see what sticks. The original Galaxy Tab featured a 7-inch screen; the next was 10.1 inches; then came 8.9 inches. Further muddying the picture: Samsung recently announced a new line of products called "Note." The 5-inch Galaxy Note, which went on sale last month, is a stylus-equipped device meant to bridge the gap between phones and tablets. Samsung plans to release a 10.1-inch Note -- the same size as its larger Tab. According to CNET, a Samsung executive said at a trade show last month that he hoped sales of the Note tablet would cannibalize the 10.1-inch Tab. "The best thing to survive in the market is to kill your products," Hankil Yoon, a product strategy executive for Samsung, told journalists. "We want to stay competitive." So does everyone not named Apple. But when it comes to tablets, it's a trick they haven't yet figured out how to pull off.